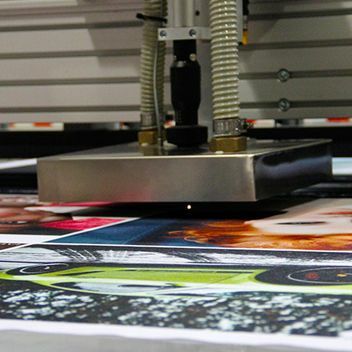 With multiple state-of-the-art grand format dye-sublimation cutting production machines we have the capacity to cut 562 lineal metres per hour in house. The machine allows an optimum use of printed fabrics due to a specially developed scanning system that scans the entire bed within 3 seconds before starting the cutting process. The feeder system advances the fabric, keeps it flat and eliminates waves on the surface. By limiting the operator’s involvement we can warrant an accurate cut every time. 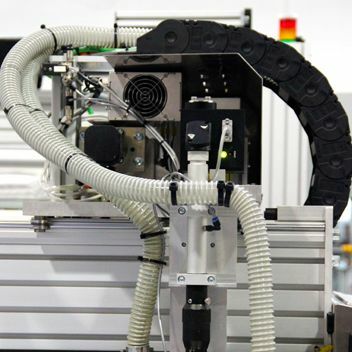 The machine will also compensate automatically for shrinkage and distortion eliminating the need for manual measurements. Fabrics will be accurately cut on-size with sealed edges ensuring that there is no fraying as well as cut the contour of the image. The machine boasts the largest automatic cutting bed in New Zealand and is able to handle fabric rolls up to 3200mm wide. The bed is in excess of 25sqm and features a series of automated feeding controls to ensure maximum efficiency. The controlled laser-cutting solution is recognised as the most advanced method of cutting textiles and incredibly the cutting point never touches the fabric. The overhead projection controlled remotely when required ensures the most accurate cut possible. We have no limitation on fabrics meaning we are able to process whatever you throw at us.